In the autumn of 2009, a group of citizens discovered that a pending neighborhood plan for North Madison, Wisconsin included several development plans for Warner Park. Among them: a pontoon boat concession in the lagoon, a new parking lot, a new soccer field in a prairie/meadow, more sidewalks, aggressive brush trimming and ceremonial sites on an island used by nesting birds. Warner Park was already one of the most heavily used urban parks in the Madison system, with 500,000 visitors every year, the Rhythms and Booms fireworks display July 4, and the Madison Mallards. The majority of the park was paved or cut into lawn. Yellow patches on this map show mowed lawn. Red is paved surfaces. The remainder, about 35 percent, was a de facto wildlife sanctuary, home to 100 species of birds, foxes, rabbits, deer and other animals. People who used the park realized that this wildlife made Warner special. Appearing before the Board of Parks Commissioners, a group of 25 asked for and won a delay in the plan, and a rewrite of the language. The pontoon boats, soccer field, island sites and parking lot were removed. Other “ideas” were tabled for further study. 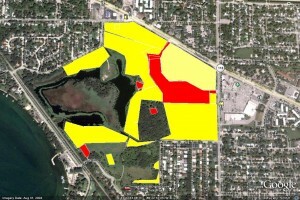 Written into the Northside plan, later adopted by the city council, was a recommendation that Warner Park’s natural areas be “carefully evaluated to protect, preserve and enhance habitat for birds, fish and other wildlife.” The plan invited participation by neighborhood environmentalists. Then, the Board of Parks Commission approved a kill of 150 geese to prevent a jet crash at Dane County Airport. What angered people about the geese decision, aside from the slaughter, was the way in which it was hatched in secret. With a Facebook page and 1,900 “friends,” many of whom appeared before the commission, the roundup was stopped. The staff was directed to work with Wild Warner activists for a long-range geese management plan. The threats to wildlife are constant. Months of outcry on behalf of the “wild” side of Warner Park appears to fall on deaf ears. The battle for Warner’s de facto wildlife sanctuary is not ecological; it is political. Unfortunately birds don’t vote. This Web site was created to carry on the campaign for wildlife, and to celebrate its existence in the disappearing margins of an urban park. The outpouring of support from park neighbors and nature lovers throughout Madison is heartening. On July 27, 2010, we gathered to form a group, Wild Warner. We became a Wisconsin nonprofit corporation (WO56794) on Aug. 10. Dolores Kester, Esq. and Jim Carrier and incorporators. Among the issues we began tackling: geese protection, tree replacement, mowing, a conservancy designation and a change in public perception and knowledge about the beauty and necessity of Warner’s wild side. Wild Warner meets monthly, on the first Tuesday 6-8 p.m. at Warner Community Center. Please add your voice by coming to our meeting, becoming a member, emailing comments or signing up for periodic messages. We post major announcements and meeting notices on the Northside Yahoo listserve. Jim Carrier, a writer and filmmaker, designed and edits the site. Trish O’Kane, a PhD student in environmental studies, supplies photos, stories and data. We welcome your contributions, comments, stories, and especially photos. You may reach us via the Contact Us link.